Come explore the meaning of a tranquil stay at Shore Haven I in the Crescent Beach section of North Myrtle Beach, South Carolina. 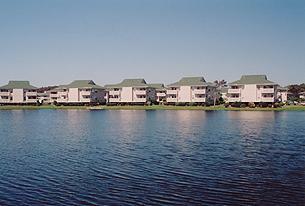 The quiet North Myrtle Beach resort is a lakefront neighborhood that is just across the street from the Atlantic Ocean. These North Myrtle Beach vacation rentals have two bedrooms and two baths and sleep anywhere from four to eight people. A full kitchen is equipped with a dishwasher, which makes it easy to clean up after preparing and serving a meal. Life is good when you wake with the sun as it peaks over the aquatic horizon and when you fall into restful slumber while a full moon casts a glow onto the darkened sea. Enjoy peace and tranquility when you enjoy a North Myrtle Beach vacation at the Shore Haven I North Myrtle Beach condominium rentals. With accommodations for eight, families love spreading out in these North Myrtle Beach condos. Walk to the white sandy beaches and get a terrific suntan while building sand castles and surfing the waves during your North Myrtle Beach vacation at Shore Haven I. Your North Myrtle Beach vacation rental is filled with convenient amenities. This North Myrtle Beach vacation property has a beautiful swimming pool. Take turns playing in the blue swimming pool and the vast Atlantic Ocean. Each offers a different experience and both are wildly fun and exciting. From the incredible North Myrtle Beach resort location, Shore Haven I is close to many shopping, dining and golf options. From outlet malls to antique stores, North Myrtle Beach, South Carolina knows shopping. Whether you are craving an all you can eat seafood buffet or want something quiet with beautiful waterfront views, North Myrtle Beach, SC can accommodate your family. Myrtle Beach, South Carolina has about 100 golf courses so you can easily incorporate some time on the links into your North Myrtle Beach vacation. Why not make this North Myrtle Beach vacation a golf package deal and make it more convenient for you? Though North Myrtle Beach, SC shopping, dining and golf are great North Myrtle Beach vacation opportunities, do not forget the live dinner theatres, water parks, ocean rides and miniature golf that the whole family will enjoy! Elliott Beach Rentals is not affiliated with onsite management or the HOA of Shore Haven I.